Some recordings you make on your iPhone are better left unsaid, or even deleted, and others you’ll want to shout out to the world. Both actions are just a tap away in Voice Memos. Tap a voice memo to open it. AirDrop (iPhone 5 or later): Tap to turn on AirDrop and share your note with other people who use AirDrop. Message or Mail: Tap to open an outgoing message that contains your voice memo. Fill in the address for one or more recipients and then tap Send. Tap another voice memo to return to the list. If a message saying your voice memo file is too large to send appears, you need to trim your voice memo using the trim tool before you trying to send your message again. Tap a voice memo to select it, and then tap the Delete button. Delete and Cancel buttons appear, giving you a moment to consider whether you really want to delete your selected voice memo. Tap Delete to say goodbye to your selected voice memo, or tap Cancel if you’ve had a sudden change of heart and you want to keep your voice memo. 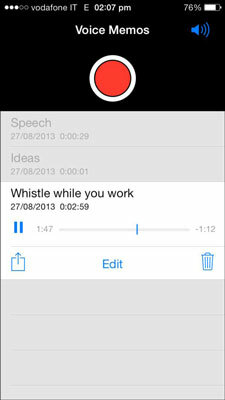 Deleting a voice memo instantly erases the voice memo from your iPhone. But that doesn’t necessarily mean the voice memo is gone forever — if you’ve turned on the voice memos sync option in iTunes, which copies all of your recorded voice memos to your computer’s iTunes library and stores them there even if you later decide to delete those synced voice memos from your iPhone. Of course, voice memos you record and then delete before syncing with iTunes are gone forever.